Due to the very poor unhealthy air quality throughout the Bay Area, we have decided to cancel open rehearsal for Saturday, 11/16. Stay inside and stay safe! We will resume open rehearsals in December. Cupcakes and Muffintops v10.0 is happening August 4th in Oakland! Are you ready for the Bay Area’s biggest fat fashion extravaganza of the year? Are you prepared to spend the afternoon in the company of some of the most gorgeously courageous, enthusiastic fat folks around, egging each other on to buy that tight leather vest or try on that bikini? Are you ready to sample delicious homemade treats? Are you ready to come in with a reasonable amount of cash, and leave with armloads of new-to-you clothes you can’t wait to wear? The fat-friendly, gender-inclusive clothing and bake sale, Cupcakes and Muffintops returns in August for its TENTH year! Presented jointly by Big Moves and the Fat Friendly Funders, we’re so proud that this bonanza of fat fashion and fellowship is becoming a Bay Area institution. If you are interested in donating your gently used plus-sized clothing and accessories to the sale AND/OR are interested in volunteering at the sale, please email cupcake@bigmoves.org We will be accepting donations through July 25th, so please contact us ahead of that date to schedule a pick-up or drop-off. Thank you! Parking and transit information: The church is on the corner of 14th and Castro in Oakland (entrance on 14th). There is unmetered street parking on Castro, as well as on 15th and 16th between Castro and MLK. There is metered street parking on 14th St. and MLK. There is a loading zone directly in front of the church where people can be dropped off and picked up. The church is four blocks (0.4 miles) from the 12th St. Oakland City Center BART station. We will be accepting cash and credit cards for clothing purchases. The door and bake sale will remain cash only. No checks please! Cupcakes and Muffintops 8.0 is coming to Oakland, CA on Saturday, 8/13! Back for the 8th year! Cupcakes and Muffiintops, The fat-friendly, gender-inclusive clothing and bake sale returns in August. Presented jointly by Big Moves and the Fat Friendly Funders, we’re so proud that this bonanza of fat fashion and fellowship is becoming a Bay Area institution. Pricing info: Most clothing $1-7; Some boutique items $10 and up, shopper’s discretion. We are accepting clothing donations in sizes L and up! If you are interested in donating clothing to the sale it must be IN OUR HANDS by Wednesday, August, 3rd. We cannot accept donations after this date. If you wish to donate, please send an email to cupcake@bigmoves.org ASAP and we will be in touch shortly about arranging a pick up or drop off. Thank you! We cannot accept clothing donations at the door. We are excited to announce that we will be accepting both cash and credit cards for clothing purchases. The door and bake sale will remain cash only. Accessibility Information: This event is wheelchair accessible. Accessible ramp in the front of the church on 14th, and the venue has accessible restrooms. There is street parking and the venue is ~1/2 mile from the 12th St. Oakland City Center BART. A note about the clothing: we put the call out for donations of clean clothes but don’t wash them ourselves, so some may arrive with pet hair, scented detergents, or smoke. We are working on booking our dates for our 2016 events and we will let you know as soon as we know what is happening when. In the meantime, open rehearsals with emFATic DANCE are continuing on the first and third Saturdays of the month, so come on out dance with us! Also, take a look at this video emFATic did for Rainbeau Curves late last year. We had a lot of fun and love how the video turned out. 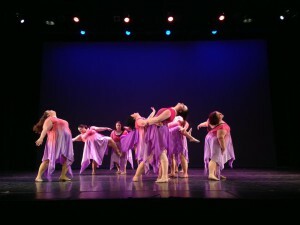 After a really busy production season the emFATs are taking a week off, so we will not be having open rehearsal on 7/4. Open Rehearsals will resume on 7/18…see you then! Fat Reign THIS WEEKEND (6/13-6/14) in Oakland! emFATic DANCE is the resident company of Big Moves and has been delighting audiences around the Bay Area and beyond since 2001. emFATic DANCE is bringing fourteen dancers and six dances to Fat Reign showcasing high energy jazz, lyrical, contemporary, and live singing! Raks Africa is Oakland’s award-winning bellydance duo. Etang Inyang and Tammy Johnson have been shimmying together at venues across the country since 2006. They also are the co-directors of the Girls Raks Bellydance and Body Image Program for young women ages 13 to 24. raksafrica.com. Shapes & Shades Dance Company is a brand new contemporary/ hip hop company focused on promoting diversity in dance and they also teach dance and body positivity to youth. The Tartlettes are a glamour-loving group of gals who aim to pay homage to the 20s and 30s with their synchronized chorus line, dancing historically-accurate routines with charleston, lindy hop, and tap. Magnoliah Black breaks all boundaries as a dancer, singer, mc and producer by blending modern burlesque with performance art and activism. This quadruple threat got her start with the round and rowdy award winning troupe Rubenesque Burlesque six years ago and continues to shake up the scene with every sashay and sway. PawsUP! is fatter than your average garage band and queerer than a $3 bill. Between us we play 8 instruments and have 7 pets. The House of Lordes is a performance collective with members Brock Cocker and Tyrone Peaches. Tyrone Peaches is a down home boy with a lot of sugar in his tank. He has performed with the All Black Drag King Group – Nappy Grooves and as Nefarious Vulvaleen, his Glamazon counterpart. Brock Cocker loves all kinds of people especially those with a little jiggle in the middle and has performed up and down the West Coast. Sarah and Tigress began dancing together as the fulfillment of a Scorpio pact in 2013. This is their third performance together in the Big Moves show. Follow Sarah at notblueatall.com. Follow Tigress at iofthetigress.com. The FFE Models represent fat glamour in sizes 14 and up. As representatives of Full Figure Entertainment, they help get the party started at Full Figure Fridays and help spread the word about body love and size acceptance. 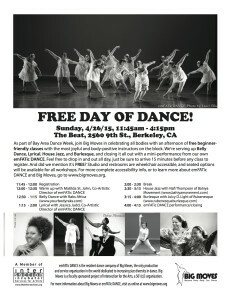 Check outfacebook.com/ffemodels or follow @effieoakland on Instagram for more information. Lucia N. Habitions, burlesque performer and long time member of Rubenesque Burlesque, is what you get when you cross growing up in the childrens’ Beauty Pageant circuit, 30+ years of dance and theater training, and an obsession with all things vintage. Ms. Juicy D. Light is a Fierce, Radical, Fattie Femme. Founder and Artistic Director of Rubenesque Burlesque and Producer of First Friday Follies and Salacious Under-ground, she, as a solo performer and with Rubenesque Burlesque, has traveled all over the country and Canada changing minds and hearts regarding the sensuality and beauty of fat women. Fat Reign Tickets On Sale Now! 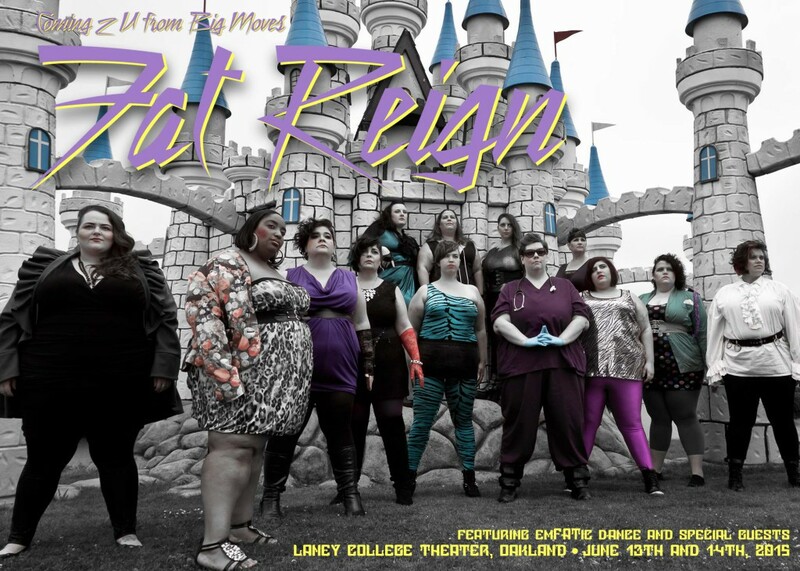 We are happy to announce that tickets to Fat Reign (June 13th and 14th 2015 at Laney College Theater in Oakland) are on sale NOW! Get yours and tell your friends! Advanced tickets can be purchased at http://fatreign.brownpapertickets.com . 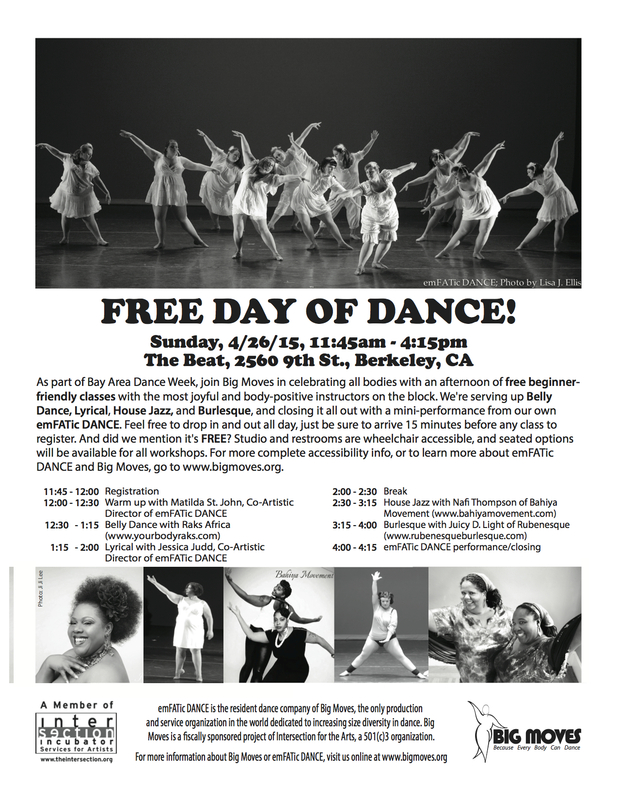 We are getting very excited about our annual FREE Day of Dance coming up on Sunday April 26th, 2015. Here is the day’s schedule. You are free to drop in and out all day, we just ask that you show up 15 minutes prior to the first class you wish to take so you can register and get settled.